Teen Program Vision: It was the wish of our late, most compassionate Head Lama H.H. Jigdal Dagchen Sakya Dorje Chang that the Teen group at Sakya Monastery learn how to “Be Happy, Make Happy.” Teen Dharma school (founded by Teresa Lamb and Moses Tovar) accomplishes this by studying the teachings of the Buddha and the special prayers and practices of Tibetan Buddhism and weaving them together with the latest sources of information on living a happy life. Teens create the tools to become resilient, empowered, compassionate individuals and to “Be Happy, Make Happy” while meeting the challenges of today’s changing world. We also have guest speakers for special topics, and the very Special ongoing monthly Meditation and Instruction with Venerable Lekshay Sangpo. Note: We recently began a study of the Four Noble Truths using various resources, and will move into studying the Noble Eightfold Path. 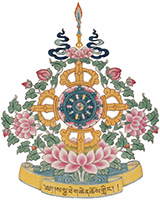 Also please check the online calendar at https://www.sakya.org/calendar/ to confirm that the Teen group is meeting. Teresa Lamb feels extremely blessed to be a student of H.H. Dagchen Sakya Dorje Chang and H.E. Avikrita Vajya Rinpoche, and has been an active member of Sakya Monastery since 2005. Currently, she is involved in Marici Fellowship as a co-facilitator, and is co-VEI Chair for the Board of Advisors and leads the Teen Dharma program.